Who will win the Eagles QB job? 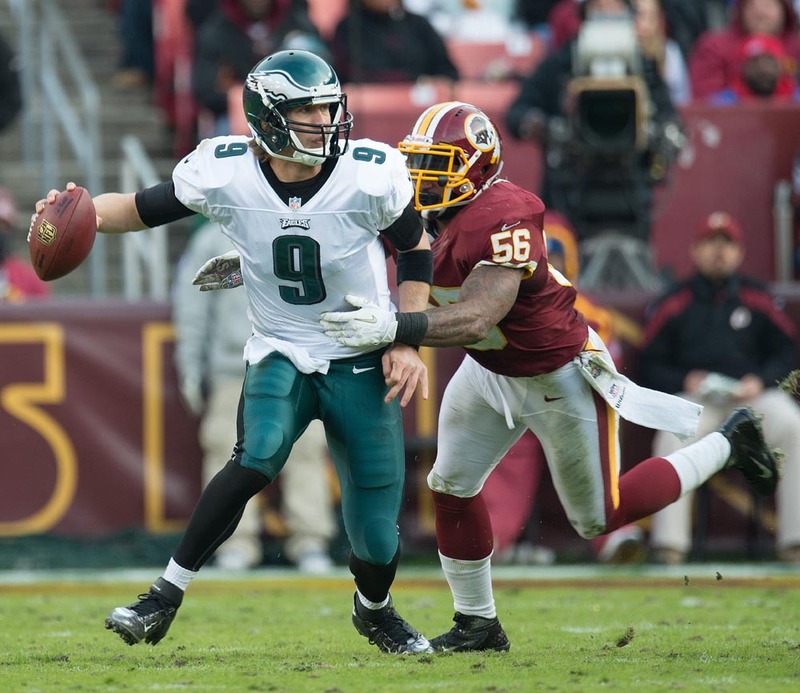 Philadelphia Eagles quarterback Nick Foles is chased and sacked by Washington Redskins inside linebacker Perry Riley at FedEx Field in Landover, Md., Nov. 18, 2012. The 2013 Philadelphia Eagles are looking to pick up the pieces of the puzzle that were missing last season. The team’s four wins in 2012 were the franchise’s lowest season total since 1998, and heading into training camp, the Eagles are still missing a very important piece of that puzzle: a starting quarterback. The quarterback battle is between Michael Vick, Nick Foles and rookie Matt Barkley. Barkley is taking the second-team reps while Vick and Foles, who both started at times for the Eagles last season, are currently splitting first-team reps. Vick, who has been the starter for much of his career in Philadelphia, is not too happy about that. On the other hand, Foles has been battling for the starting spot since the Eagles drafted him in 2012. The major wild card is the rookie, Barkley, who was drafted in the fourth round this April out of the University of Southern California. He had a great career at USC and was considered by many to be a top-10 draft pick after his junior year. Instead, Barkley chose to stay for his senior year to try and win a national championship. His dream fell short, however, as he and the Trojans struggled. The team finished with six losses, and Barkley threw twice as many interceptions as he did in the previous year. Reports indicate that Barkley has been doing well this offseason. But even though he has been throwing great passes, he is going to have to prove more to the coaches before being named the starter. Some of the players on the team expressed who they think will win the position by week 1 of the season. Most veterans on the team, such as wide receiver DeSean Jackson, predicted that Vick would win the battle. But Chip Kelly is the new sheriff in town, and he has been shaking things up since his arrival in Philadelphia. Kelly has already shown that he is unconventional, which is why he makes not naming a starting quarterback seem like normal behavior. The Eagles started training camp July 23, and you can bet that Kelly is examining the last piece of his puzzle very slowly and very intensely.